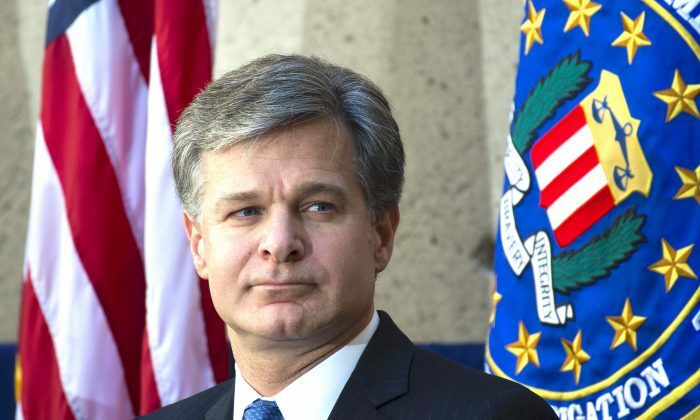 FBI Director Christopher Wray revealed on July 18 that the FBI is investigating Chinese economic espionage cases in all 50 U.S. states, and that China is regarded as the “most significant” long-term threat to the United States. The Chinese Communist Party (CCP) is using a set of unconventional warfare methods against the United States, designed to achieve the goals of war without the need for troop-on-troop combat. This includes subversive methods to infiltrate and undermine U.S. institutions, propaganda operations to alter public perception, economic warfare programs to steal from the U.S. economy, and more. Many of these strategies were outlined in a 1999 Chinese military book, “Unrestricted Warfare.” Many of the tactics also pull from older subversive methods used by the Soviet Union, and go beyond them. Subversion is used by communist regimes to gradually seize control of a country by attacking and undermining the institutions that make it function, driving its population into conflict, in order to bring the country to a state of crisis that allows for outside intervention, either through foreign invasion or a new political structure. It is also designed to gradually achieve the goal of creating a communist state by subverting and destroying religious belief, morality, and tradition through infiltrating institutions, and by creating advocacy movements, among other methods. House Intelligence Committee Chairman Rep. Devin Nunes (R-Calif.) brought attention to the economic arm of the CCP’s unrestricted warfare system in a hearing on July 19. “Fortunately, the fact that Communist China has actually been waging ‘unrestricted warfare’ against the United States for decades is the focus of an important congressional hearing today,” Gaffney said. The CCP’s unrestricted warfare system is often highlighted in discussions about Chinese cyber threats and theft of intellectual property, but the strategies go far beyond this. Unrestricted warfare utilizes a long list of methods, including “culture warfare,” “smuggling warfare,” “drug warfare,” “environmental warfare,” “guerrilla warfare,” and many others. These methods may be divided into categories of needing no military involvement, some military involvement, or full military involvement. 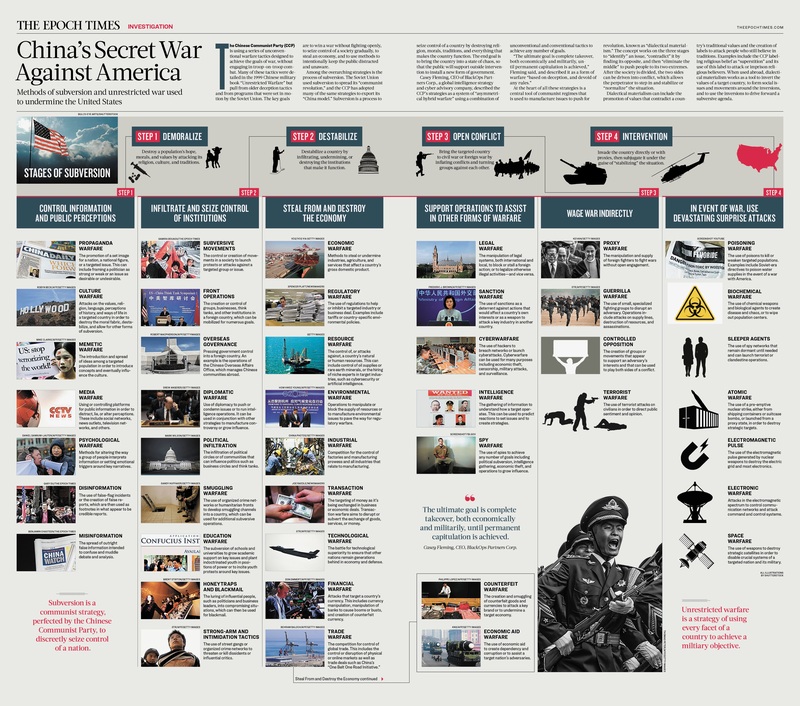 Infographic on subversion and China’s secret war on the United States. (The Epoch Times) Click here for high-res version. A related strategy, inducted into the official strategies of the CCP’s People’s Liberation Army, is its “Three Warfares” system, which includes psychological warfare designed to alter how people interpret information, media warfare to control what information is available, and legal warfare to manipulate international court systems. While the subversive and unconventional warfare tactics used by the CCP are coming to light, the broader picture is still not widely understood, according to Casey Fleming, CEO of BlackOps Partners Corp., a global intelligence strategy and cyber advisory company. “Most senior leaders and lawmakers are unaware of the deep extent of espionage and vast infiltration Chinese government has perpetrated in all sectors over the past two decades,” Fleming said. According to Fleming, while Chinese espionage cases are now being investigated across the United States, the cases need to be understood in the broader context of the CCP’s strategies. “Extensive Chinese espionage is tied to a broader strategy to subvert the United States ideologically and to eventually overtake the United States both financially and militarily through robust and consistent intellectual property theft, under the guise of plausible deniability,” he said. “I think China, from a counterintelligence perspective, represents in many ways the broadest, most challenging, most significant threat we face as a country,” Wray said.